Renault Pulse is the third model by Renault in the Indian market. After Renault ceased the JV with Mahindra, Renault has prepared an aggressive strategy to establish itself in the much competitive car market. In an effort to emerge as an independent identity in the country, the French auto biggie came with Renault Fluence and lately brought into fore the extremely pricey SUV - Renault Koleos. Renault India wants to extend its reach in every car segment. Renault Pulse at present is available in the Indian market in 7 different variants both in petrol and diesel option. The petrol variant includes the Renault Pulse RxE, Rxl and RxZ while the diesel variant includes the Renault Pulse RxL, RxL Optional, RxZ and RxZ Optional. The Renault Pulse was first unveiled in 2011 at a grand event of Formula 1 racing in Noida, but the car was launched at the 2012 Delhi Auto Expo. Initially the diesel variants of the car were launched due to the demand for diesel cars in the market caused by the petrol hikes in the country but in May 2012 the petrol variants were rolled out in the market. The company, which is focusing on the top-down strategy to establish the brand in the Indian market, is simultaneously working on plans to enter the core market which is highlighted by hatchbacks in India. It plans to launch a range of vehicles based on a completely new platform in the A segment. Renault Pulse Petrol RxL is powered by a 1.2 L XH5 engine that generates 74.48bhp at the rate of 6000rpm and 104Nm at the rate of 4000rpm. The car is also fuel efficient as with such power and torque it delivers an average mileage 16kmpl which is pretty good. The hatchback is also packed with many advanced safety and comfort features. Renault Pulse posses everything that is apt for the rapidly growing Indian premium compact car market. The car is designed on the Nissan’s existing V platform that has enabled to reduce the development cost for Pulse. The front of the car is very sharp with its elevated crisply designed dual beam H-4 follow me headlights, Hyundai like hexagonal black grille and a typical Renault matt black center section. A chrome lining underlines the grille with the Renault logo at the centre; the body color bumpers make the look more attractive. The bonnet and tinted windshield both are squeezed in length rendering the sub-compact look of Pulse. Body color door mirrors and pull type door handles with green tinted glass mark the side profile. A and C pillars are extremely curvy and sweep a lot towards each other forming a semi-circle on the side of Pulse. The Exterior dimensions of this hatch are length – 3805mm, width – 1665mm and height – 1530mm. Wheelbase of the car is 2450mm and it measures just 970kgs. Interior of this car are very elegantly designed and helps in positioning the Pulse the top – end of the A-B segment . The hatchback has arched roof and a big roomy cabin. The interior design is in two different themes with the plum and black dashboard, the dual tone dashboard beauty is further enhanced by the decent HVAC controls, completely foldable four AC vents, integrated CD player and a happening unique circular control looks amazing on centre console. The leather power steering has a diamond shaped Renault logo and steeply placed glove box completes the dash board. The instrumentation panel on the dash includes the Tachometer, Electronic Multi Trio meter and digital odometer. The car under its hood carries a 1.2 L in-Line petrol XH5 engine. This 3 cylinder engine has 4 valves per cylinder in DOHC configuration and Electronic Fuel Injection system . The engine is capable of producing a maximum power of 74.48bhp at the rate of 6000rpm and a maximum torque of 104Nm at the rate of 4000rpm, with this acceleration and pick up we can readily accelerate the car from 0 – 100kmph in just 10.5 seconds and can reach a top speed of 180kmph. The car is also very fuel efficient as it delivers a mileage of 14kmpl in the city driving conditions and 18kmpl on the highways. The fuel tank capacity of the car is 41 liters which allows you to cover a distance of 656kms once full tank without refueling. The engine is complied with BSIV emission; Bharat Stage emission standard which check the pollution caused by the internal combustion engines. The engine is mated with a 5 speed manual transmission system which further improves the engine efficiency. The brake mechanism of the car includes the large ventilated disc brakes in the front while drum brakes at the rear. As this is the low end variant so it lacks ABS with EBD and Brake Assist. The turning circle radius is just 4.65 meters and power steering making it a good city car. The suspension system is same as that of Micra. Pulse runs on McPherson Strut type suspension and rear Torsion Beam type forks that not only allow a comfortable drive but also support the vehicle's stability on the roads. Renault Pulse Petrol RxL carries forward the Renault’s tradition of safety, quality and innovation. The safety features in the car are central locking, power door locks, child safety locks, anti theft alarm, day and night rear view mirror, passenger side rear view mirror, rear seat belts, door ajar warning, impact beams, adjustable seats, engine immobilizer and centrally mounted fuel tank. There are also some active safety features in the car like driver airbag and Xenon Headlamps. The car also comes with the keyless entry feature which allows you to lock and unlock your car without using the key. Along with the safety features the hatchback also advanced comfort features to give you a safe and comfortable ride.Renault Pulse comes blessed with Air conditioner with Automatic Climate Control. Power windows with one touch up and down function on driver side and power + tilt steering will make the drive easy and comfortable. Folding rear seats, green tinted glass, lock/unlock sensing automatic folding ORVMs, central locking, internal release for fuel lid are the interior comfort options in Renault Pulse.Fabric accented front door trim with front door trim pockets, follow-me-home headlamps, engine start/stop button with illumination, on-board Trip computer, front cabin lamp with reading light, key answer back function, trunk room lamp, bottle holders, day/night inside rear view mirror, dual front vanity mirror with lid, 3 assist grips and a 12V power outlet will dress the interiors of the car and make it look like a mini luxury hatchback. Bluetooth, AUX-In, ABS with EBD missing. 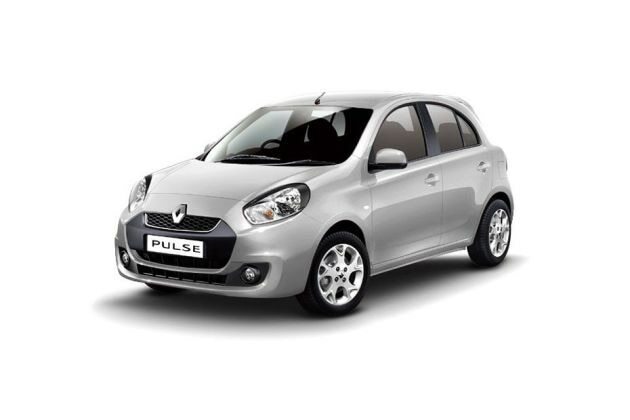 Renault Pulse 2012-2014 is available in 7 different colours - Pearl White, Metallic Grey, Cosmos Blue, Mettalic Silver, Solid Black, Metallic Red, Champagne Gold.